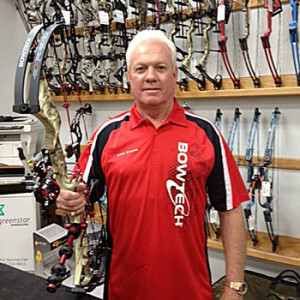 My name is Jack Hodgkinson, and I have been with Bowtech as a member of their Pro Staff for the past 8 years. I’m a retired federal officer, and have been retired for 16 years. Prior to working for Uncle Sam, I was serving Uncle Sam in the United States Navy spending 4 tours in Viet Nam on river gun boats with the Navy Special Forces from 1966 to 1969. I have been involved in archery off and on all of my life. I was teaching archery at the early age of 16 in my hometown of El Reno, Oklahoma for the youth summer recreation classes, back in the early 1960’s. During the past 20 years I have been very active in archery hunting, 3D competion, and teaching archery. I do volunteer work Monday thru Friday for H&H Shooting Sports Complex in Oklahoma City, Oklahoma, helping sell,teach and promote Bowtech and Diamond archery products. If you haven’t shot a Bowtech yet, you need to get on board, and I’m the guy who can help you!!! !